Today’s high-tech manufacturing requires extensive use of integrated circuits and other sensitive devices. The new circuit packages are very durable. But when being stored in a typical manufacturing environment they become exposed to contaminants in the atmosphere causing corrosion and oxidation on the leads, ultimately resulting in poor solder contact and possible board failure. Also, moisture-laden air, absorbed into the packages can cause excessive failures when subjected to the heat of the solder reflow process. Additionally there are hidden ESD dangers that are present when dealing with sensitive devices. Clear, clean, moisture free storage in a Desiccator cabinet, a mini-cleanroom environment, isolated from the typical warehouse and manufacturing atmosphere. 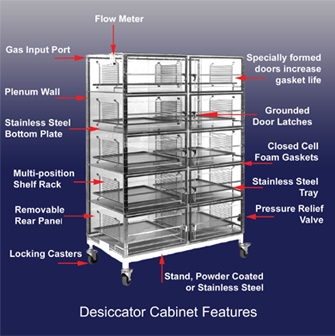 A Desiccator cabinet provides a cleanroom environment at a fraction of the cost. The input of nitrogen or compressed dry air into the cabinet displaces the contaminated air and provides a truly ideal eco-system for your components and devices. However, the lowered moisture levels increase the likelihood of ESD damage. Fortunately, our system of Static Dissipative Coating, stainless steel trays and bottom plates and electrical grounding of all conductive surfaces is a proven means of effectively combating the negative side effects of reduced humidity. Constructed from quality cast acrylics, PVCs or static dissipative sheet, our cabinets and enclosures provide the optimum conditions for your sensitive components and devices. We offer a complete line of stock size desiccator cabinets, bench top workstations, screen frame storage cabinets and optional accessories. We also will fabricate to your specifications. Custom sizes and designs are a specialty. By using our standard flow meter and individual relief valve, our enclosures offer maximum efficiency, reduced purge times and lowered nitrogen consumption. We offer a variety of trays, bottom plates and stands as options for our desiccator cabinets. Trays are available in ½” or 2” depth. Fabricated from either clear acrylic, with optional static dissipative coating (SDC) or from stainless steel. Optional stainless steel bottom plates mounted and grounded in each chamber provide superior ESD protection while also protecting the SDC coating or SDS sheet from excessive abrasion. The cabinet stands are constructed from 1 ½” square steel tube with adjustable leveling feet and a baked powder coat finish. Stands are also available in electro-polished stainless steel. Please contact us for a quotation on a desiccator cabinet. For Static Dissipative Coated Cabinets add SDC to the Stock No. For Static Dissipative Sheet Fabrication add SDS to the Stock No.